We've had a stint of warm (in the 80's!) weather here in central Pennsylvania, which is wonderful, but it's causing all my rhubarb to bolt. Despite that minor gripe, I've found comfort and solace in being able to fire up the grill. Hot days, but chilly nights in the mid 30's and low 40's have me in the mood for something grilled, but still savory and filling. 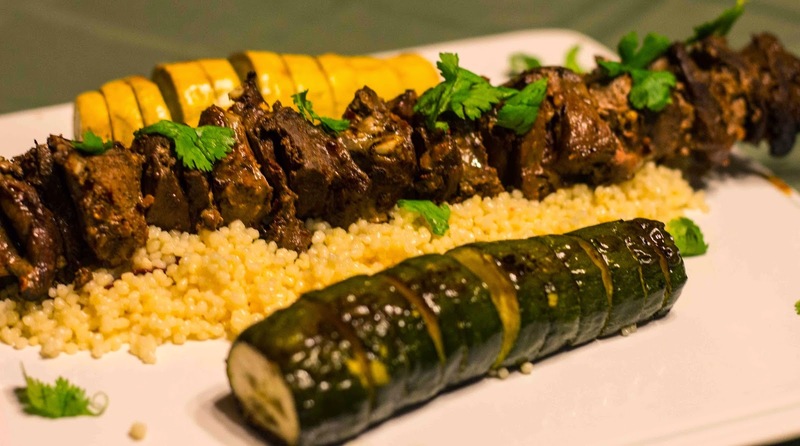 Making these liver and hear kebabs was a great "transition" dish, with the richness of main ingredients you'd think of as a cold-weather meals but presented in a way that celebrates the blossoming spring and approaching summer. Both liver and heart take well to grilling - they can get a good sear and are nice cooked to medium-rare or medium. It's important not to over cook the meats to keep them from drying out and getting tough. Plus, overcooked organ meats generally brings overpowering minerally and gamey flavors to the front, masking any subtler flavors. Also, since liver and heart do not have much fat, you should oil them (and the grill) particularly well to keep them from sticking. 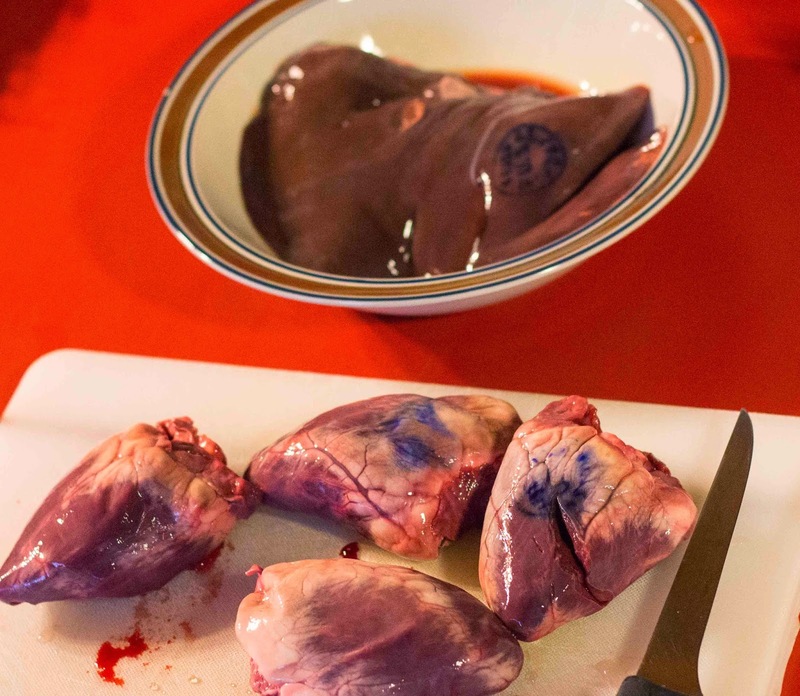 For these kebabs, I sliced up goat hearts and livers into small squares and skewered them, alternating a thin slice of heart with a slightly larger cube of juicy liver. To oil the kebabs, I heated olive oil with a harissa spice blend of hot and mild dried chilies, cumin, caraway, and lots of fresh garlic. As the oil heated, the chiles warmed up and infused the oil with a beautiful reddish-orange color. I kept a few tablespoons of this harissa oil aside for a finishing touch, but splashed the rest over the kebabs, rotating them several times to generously coat all the organy nooks and crannies. Marinating liver and hearts in harissa oil. To soak up all the flavorful juices from both the oil and the grilled meat, I made some plain couscous. This formed a small nest for the kebab to rest in after grilling. 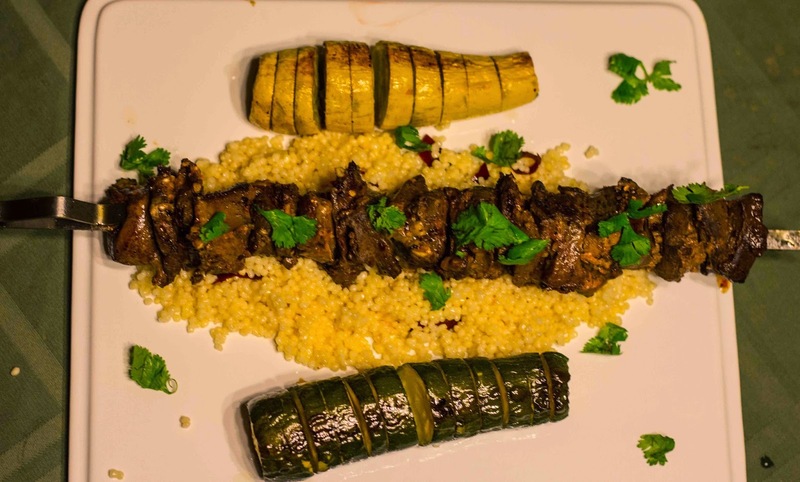 With the strong flavors of the goat heart and liver, coupled with the spicy chiles and pungent garlic, the couscous also offered some respite to refresh the palate. Some grilled squash was also perfect to serve alongside the kebabs. This was a wonderful dish, and I do wonder if it would be a good meal for the less-than-enthusiastic eaters to try out some heart and liver. The spicy rub mitigated any strong flavors from the organs, allowing the heat of the chilies, the smoke from the grill, and the savory notes from the meat to carry the dish. Also, I've become more inclined to look to smaller animals for offal - they seem to be much milder in general than larger, older animals like cows.